Power BI has truly evolved over the past few years. From an add-on in Excel to a true organisation wide BI platform, capable of scaling to meet the demands of large organisations; both in terms of data volumes and the number of users. Power BI now has multiple flavors and a much more complicated licencing model. 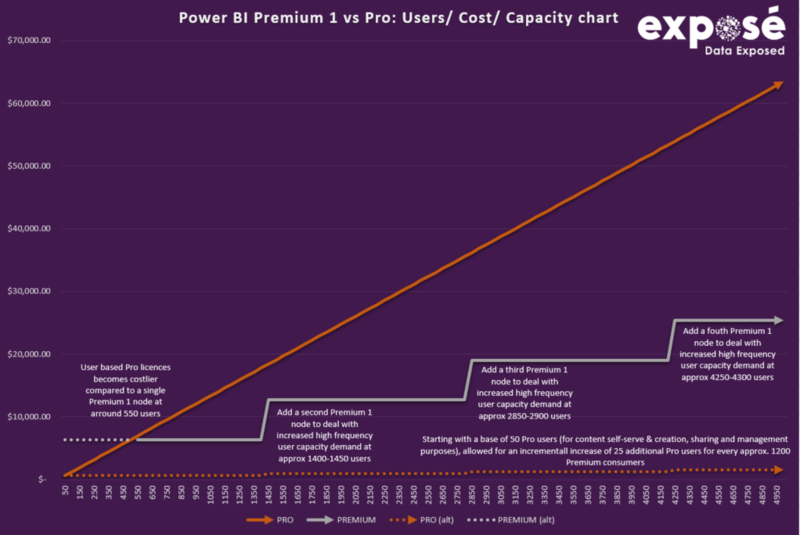 So, in this article, we demystify this complexity by describing each flavor of Power BI and their associated pricing. We summaries it all at the end with some scenarios and in a single cheat sheet for you to use. Desktop, Cloud, On-premise, Pro, Premium, Embedded – what does all of this mean? I thought it best to separate the “why” (i.e. why do you use Power BI – Development or Consumption), the “what” (i.e. what can you do given your licence variant), and the “how much” (i.e. how much is it going to cost you) as combining these concepts often leads to confusion as there isn’t necessarily an easy map of why what and how much. “Why” deals with the workload performed with Power BI based on its deployment – I.e. why do you use Power BI? Is it for Development or for Consumption. This is very much related to the deployment platform (i.e. Desktop, Cloud, On-Premise or Embedded). The term “consumption” for the purpose of this article could range from a narrow meaning (I.e. the consumption of Power BI content only) to a broad meaning (i.e. consumption of-, collaboration over-, and management of Power BI content – I refer to this as “self-serve creators”). In the table above, I not only dealt with the “why”, but I also introduced the variants of Power BI; namely Desktop, Free, Pro, On-Premise and Embedded. Variants are related to the licence under which the user operates and it determines what a user can do. Confused? Stay with me…all will become clearer. The Power BI journey (mostly) starts with development in Desktop, then proceeds to a deployed environment where it is consumed (with or without self-serve). Let’s close the loop on understanding the flavours of Power BI by looking at what this means from a licencing cost perspective. Disclaimer: The pricing supplied in the following table is based on US-, Australian-, New Zealand- and Hong Kong Dollars. These $ values are by no means quotes but merely taken from the various calculators and pricing references supplied by Microsoft as at the date of first publication of this article. **Other ways to embed Power BI content are via Rest API’s (authenticated), SharePoint online (via Pro licencing) and Publish to Web (unauthenticated), but that is a level of detail for another day. For the purpose of this article, we focus on Power BI Embedded as the only embedded option. Even if you deploy to the Cloud and intend to make content available to pure consumers of the content only (non-self-serve users), whether it be in PowerBi.com or as embedded visuals, you will still need at least one Pro licence to manage your content. The more visual content creators (self-server creators) you have, the more Pro licences you will need. But, it is worth considering the mix between Pro and Premium licences, as both Pro and Premium users can consume shared content, but only Pro users can create shared content (via self-service), so the mix must be determined by a cost vs capacity ratio (as discussed below). Premium allows users to consume shared content only. It does not allow for any self-service capabilities. Premium licences are not per user, but instead, based according to planned capacity, so you pay for a dedicated node to serve your users. Consider Premium licencing for organisations with large numbers of consumers (non-self-serve) that also require the dedicated computer to handle capacity. The organisation would still require one or more Pro licences for content management and any self-serve workload. Premium licencing is scaled as Premium 1, 2 or 3 dependant on the number of users and required capacity. You can scale up your capacity by adding more nodes as P1, P2 or P3, or scale up from P1 to P2, and from P2 to P3. With Pro licences you use a shared pool of Azure resources, so is not as performant as Premium which uses dedicated resources, so there is a second tipping point where your capacity requirements won’t be sufficiently served by Pro. Right, you now understand the “why”, “what” and “how much” – let’s put it all together through examples (I will use Australian $ only for illustrative purposes). Please note that there are various ways to achieve the scenarios below and this is not a comprehensive discussion of all the options. A small organisation with 1 Power BI developer, 5 additional self-service creators and 10 additional consumers of visual content, with no custom applications/ websites. A small ISV organisation with 3 Power BI developers want to embed Power BI content in an application that they sell. The application must be up 24 x 7 and do not require a very high volume of concurrent users, but licencing cannot be on a per-user basis. A medium sized organisation with 5 Power BI developers want to embed Power BI content in an internal portal such as SharePoint which is used by potentially 250 users. They also have 10 self-service creators and 25 consumers of Power BI content through the Power BI portal. Disclaimer: The pricing supplied in the following table are by no means quotes, but merely taken from the various calculators and pricing references supplied by Microsoft as at the date of first publication of this article.